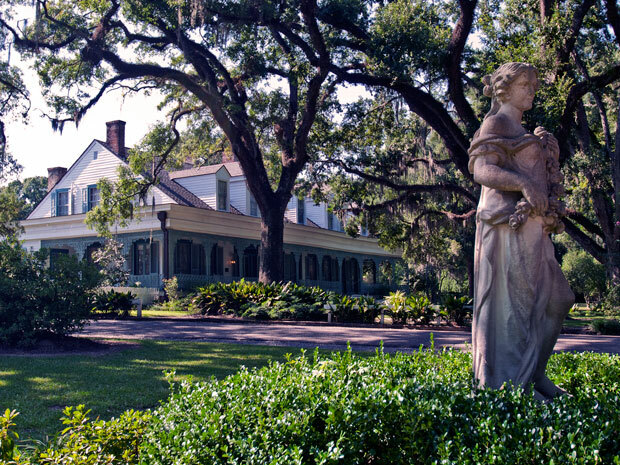 We are doing some EVP sessions outside the grounds of the myrtle's plantation in front of the caretaker's cottage and behind the actual house itself. We ask if "someone is out here" and a few seconds later we have a somewhat intelligent response. Around 0:17 seconds you can hear what sounds like a male spirit voice saying.."Little Cottage". If you wear earphones you can hear this pretty clear...we have not altered this voice in any way, shape, or form. Was this an intelligent response telling us where this spirit was at this moment. It almost sounds like the same voice as the Video #2 below but this voice is much clearer. VIDEO #2 "Get off...Your Trespassing"
This video REQUIRES headphones to hear. It is extremely faint and we did not even know we captured it until we listened to it with our software. This is what we believe is a male spirit's voice saying "GET OFF...YOUR TRESPASSING". It is around 0:15-0:16 seconds into the video. Was this a former owner telling us to get away from his home? Matthew saw what he thought was a child standing directly behind me so we started recording right outside of the caretaker's cottage. During this EVP session we were recording video and caught this light anaomaly shoot straight down from the top right and go down to the bottom left. It is extremely bright and we have ruled out the idea of this being a bug because we filmed for over 4 hours outside all over the place and we have seen bugs fly by and they look nothing like this. Also this obviously isn't any kind of dust. The reason we relate this to paranormal is because of what Matthew saw directly behind me...we turned around to record and within a few seconds later we captured this. This is an EVP which is quick...but obviously none of us..It sounds like a deep man's voice saying "Sorrow". The only thing we did was enhance audio. At .07 seconds you will hear a direct response to what our tour guide is talking about. This to us is proof of intellegent paranormal spirits. Our tour guides says, "you shouldn't smell smoke anywhere in this house" then you hear what sounds like a small child's voice in the background say "I do". This is a great EVP. EVP #3 "You're a B*tch"
This is a fast EVP and it is not the clearest we have ever have but we tried our best to clean it up a bit and what we gather from this is "Get Help". If you guys ever dis-agree with what we have please e-mail us so we can listen again and give us your input!! Again not the clearest EVP we have ever captured and it is somewhat muffled and fast...but it seems to be a direct response to our question. We ask "say our names and who pisses you off the most"...We get a "You do"...it is kind of hard to hear. This EVP is me by myself in the caretaker's cottage and I am just rambling on trying to get a response. I get a loud YELP or a high pitch NO while I finish talking. I know this is something because again I was by myself in the caretaker's cottage at this point with the other member's investigating else where. Interesting EVP. Headphones may be good to use to listen to this EVP. It sounds like a male spirit saying "Leave". It is somewhat fast and again headphones would be better to use on this EVP.